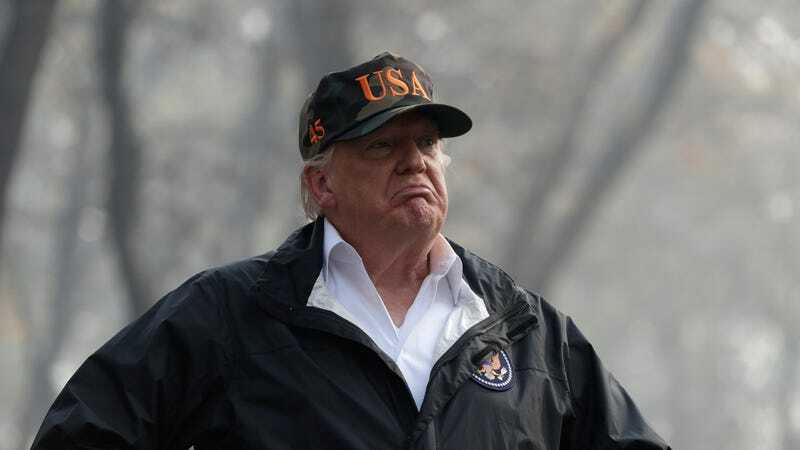 President Donald Trump traveled to Northern California this weekend to survey the area affected by the Camp Fire, which has become the deadliest and most destructive fire in the state’s history. During the visit, the president appeared to double down on some of his previous rhetoric involving what he has described as forest mismanagement. CNN reported Saturday that Trump toured properties in Paradise, the community of 27,000 that was nearly completely destroyed in the fire, before answering questions from reporters alongside Paradise Mayor Jody Jones, FEMA Administrator Brock Long, California Governor Jerry Brown, and Lieutenant Governor and Governor-elect Gavin Newsom. Trump has consistently blamed the fires on “gross mismanagement” of California’s forests—an accusation disputed by experts and officials—and has suggested that he would pull federal funding from the state. The president doubled down on his previous comments about forest management on Friday, just one day before flying to California, in an interview with Fox News’ Chris Wallace. As of Saturday, 71 people are dead and more than 1,000 are unaccounted for in the Camp Fire, which is still blazing in Northern California. The fire has burned 148,000 acres, according to the California Department of Forestry and Fire Protection, and is 55 percent contained more than a week after it began. While it’s true that more could be done to reduce fire fuel loads on landscapes managed by the U.S. Forest Service—an aspect of the agency’s mission that has gone underfunded for years—experts have called Trump’s claims ill-informed and grossly oversimplified when it comes to California’s recent fires. One thing’s for sure: “Raking” isn’t going to solve California’s fire problem, and any suggestion that there’s any such quick and easy solution is at best delusional and at worst dangerous.